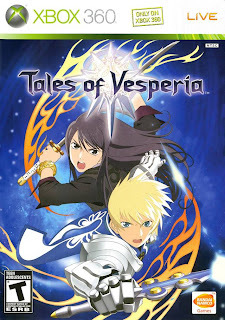 Tales of Vesperia is an impressive, original JRPG that follows a sarcastic yet compassionate 21-year-old named Yuri Lowell. The game begins with players watching Imperial Guards fighting rabid animals, followed by the beginnings of a secret plot in the Imperial capital Zaphias. The opening then turns to the Lower Quarter, a poor section of Zaphias whose inhabitants are tormented by the Imperial Guards, where an aque blastia (magical machine to create clean drinking water) has been stolen and is causing chaos. Yuri attempts to retrieve it only to be captured by one of the Commanders of the Imperial Knights, the leading organization that protects the Empire, and he is thrown into jail. Through making his escape, he runs into a noble named Estellise who is trying to run away for her own personal reasons. A very naïve and sensitive girl, Estellise becomes very crucial to the storyline, as the story progresses to become a power struggle over the blastia technology between the Empire, the Guilds, and all who inhabit the planet. The plot is very original and highly in-depth. The main protagonists stray away from general archetypes, and the voice acting adds a layer of realism and depth to their characters. Special dialogue options triggered with the Select button reveal small discussions between certain characters which brings to life their daily thoughts and feelings. While this may seem a bit useless at first, it does add a new dimension to the plot, revealing the character’s thoughts and feelings in a way without overloading players with cut scenes. These dialogues are shown through boxes revealing the characters involved, and the presentation may appear a little out-dated to some players. Many of their actions reflect the hard decisions between right and wrong, values over necessity, and the storyline forces players to reflect on their own morals, asking themselves what they would have done in such a scenario. There are just as many scenes of laughter as there are of remorse and sadness, and Namco Bandai does a god job of keeping it from becoming childish and cliché while still driving a point home. In the end, unlike most RPGs where the group simply goes their own way to save an unsuspecting population, the protagonists work together with world leaders in order to accomplish a common goal. For such an unrealistic plot, the game’s realistic problems faced, both with individuals and in society, grab players in an astounding way. Like any JRPG, the game is not just about the main plot; side quests are a must, and in a game that spans 60+ hours, there are certainly some side quests to be accomplished. There are a good number of things to do, such as puzzles, extra exploration, and special monsters to defeat, but the game does very little to present such events. The side quests offer a good amount of extra items, money, and, surprisingly enough, plot, meaning that parts of the main storyline are solved by looking for a side quest players would never have known about. With so many extra cut scenes and information available, it would have been nice if such events were given a bit more advertisement. Instead, they are hidden away and must be followed in a specific order, creating confusion and a bit of frustration for players. The sights and sounds of the game are very well done. The graphics are very bright, and while Namco Bandai strays away from making the game look realistic, the looks of the game are very sharp and clean. Environments are nicely done, and the music played in each area evokes a certain ethos that contributes to the environment. With four large continents and many smaller areas to explore, the variety of music and atmosphere is refreshing. 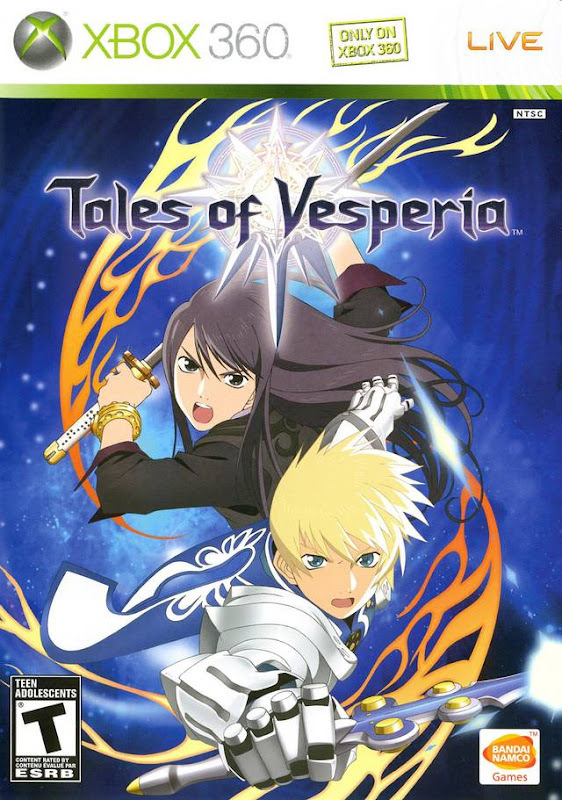 Tales of Vesperia utilizes a very efficient system of combat. You initiate battles by running into stationary enemies and are transported to a circular area of combat, where you can use 3-D movement to jump, run, and attack enemies. You can choose to set the battle system to manual, where you control everything, semi-automatic, in which the computer sometimes determines attacks or motions, or automatic, where the computer fights the battles for you. Added to this are a large number of attacks, spells, and items available during combat, which includes moves called ‘Artes’ that utilize Technical Points, or TP. The camera is a bit annoying sometimes during battle, particularly when using 3-D movement, but overall it follows the characters well. At the end of each battle the game lists several properties of the fight, including experience, money, and Grade earned. Some of these properties do not make sense until much later in the game, particularly Grade, which is used at the end of each run to purchase abilities to be used in the next playthrough. A very large part of the game is synthesizing materials, and Namco Bandai made the system both fun and innovative for players. Each character can be equipped with specific weapons and armor, and by visiting stores around the world, players can enhance older weapons or create entirely new ones, allowing characters to learn new abilities. Accessories to outfits can also be synthesized, which adds a bit of humor to cut scenes. One in particular gives Yuri Lowell a large moustache and old-school pipe, which is hilarious to see when he is arguing with the Commander of the Imperial Knights. Added to this are Titles characters can earn, which sometimes changes a character’s attire, and players can make some pretty interesting outfits. Synthesizing occurs throughout the game, and while it may seem overwhelming at first, the fundamentals are easy to understand, and players quickly learn how to master the system. All in all, the game is a classic JRPG that features unique content to keep players interested. Despite its length, the game stays fresh the entire way through, and the plot offers enough twists and turns to satisfy even the most die-hard RPG fan. Multiple run-throughs for such a long game may seem tedious, but the rewards are great, and it takes more than one run to truly appreciate the plot of Tales of Vesperia. This review is based on a retail copy of the Xbox 360 version, purchased by the reviewer.